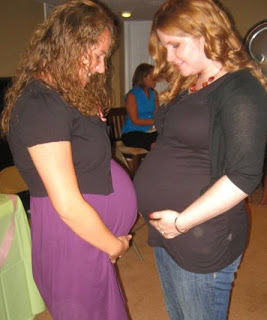 This is me at almost 33 weeks and Tiree at 30 weeks! I just got done registering for a birthing class next month and I’m excited about that! I also worked this morning and then went to register for MOPS at church to be in that too. This is exciting! Things are really coming together and I’m just under 7 weeks from my due date. We hired a trainer and she will start working with my clients in 2 weeks so it’s pretty crazy that this is all happening. I feel conflicted cause I don’t want to stop but I want to focus on being a mom as much as I can. 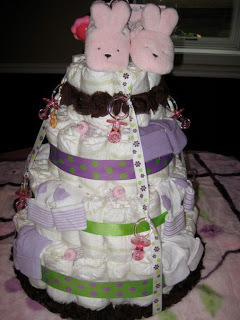 Diaper cake my Aunt Debbie made me…amazing! 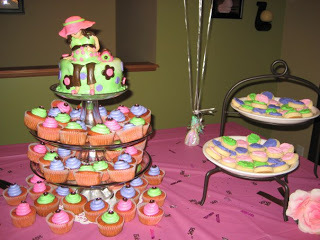 Cake, cupcakes, and cookies my mom made. Beautiful and yummy! Also, last night I made this wonderful meal of grilled chicken, mashed potatoes, salad, and corn on the cob. 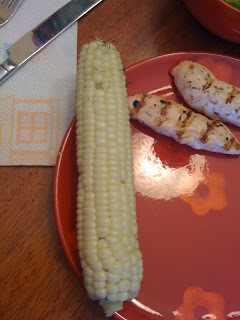 The corn on the cob came from my garden and I grilled it on the bbq. They turned out good too. Yummy! It’s so cool to eat food you grew right out of the garden! I know exactly where it comes from, God is so neat!